The weather loach (Misgurnus anguillicaudatus), also known as the dojo loach, is a hardy and friendly beginner fish that was originally found throughout Asia. In the wild, it is primarily a bottom dwelling scavenger, and has barbells similar to catfish that it uses to sift through detritus to find food on the bottom of ponds and shallow streams. The name weather loach originates from the fact that these fish can detect barometric pressure changes before a storm. When the barometric pressure falls, the fish will become extremely agitated and will dart around the aquarium in the hours before a storm. While this isn’t terribly impressive in the age of the Weather Network, they were prized for this ability in ancient times and may have been kept domestically for nearly as long as goldfish. Weather loaches tend to be a messy fish that constantly roots around in the substrate. Because of this, they should always be housed in a spacious aquarium, with strong filtration. When choosing a filter, a high quality Hang-on-back filter is an excellent choice, and can be combined with a sponge filter for extra filtration. If you can afford the hefty price tag, a canister filter is the best choice, since some weather loaches enjoy jumping or crawling up into a hang-on-back filter. While these fish are usually fine, it can lead to a few hours of frantic searching for the missing loach. And filters aren’t the only escape route for weather loaches. Throughout the hobby they are well known for being escape artists. Any aquarium housing them should have always be covered, any openings sealed with breathable material. If a weather loach does manage to jump out of the tank, they can still survive for several hours. Even one found on the floor that looks completely dried out, should be placed back in the aquarium to see if it recovers. There are numerous stories of dried out loaches being found on the floor, and miraculously springing back to life once they were placed back in the water. The water in a weather loach tank should be kept cool and should never be heated unless the room falls below 50F (10 C). While weather loaches can be kept in tropical aquariums, it will greatly shorten their life spans. A well cared for loach will live for close to 10 years in a cold water aquarium, but will usually live under 4 years when kept in a tropical aquarium. The ideal substrate for weather loaches is sand or other loose, easy to dig material. They love to dig in their substrate, and will often bury themselves up to their necks, presenting their owner the view of a group of small heads poking out of the sand. When threatened, weather loaches will disappear into the substrate, and newly purchased fish will often “disappear” for a few days, only to reappear draped across a decoration a few days later. Weather loaches are social fish, and you should always keep in groups of at least three. If they are kept on their own, they will spend most of their time hiding, and will rarely be active during the day. When they are kept in a group, their behavior completely changes – they will constantly swim around the tank, and will often sit out in the open in a “pile” of weather loaches. The don’t seem to mind piling on top of each other, and this will lead to comical positions where all the loaches are stacked up into a big loach pyramid. 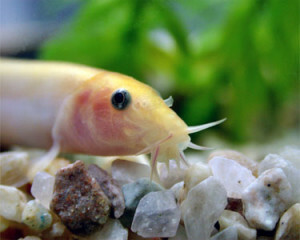 In the wild weather loaches are omnivores, and much of their diet is made up of algae and plant material at the bottom of ponds and shallow streams. They will also opportunistically feed on insects, snails and small invertebrates. In the home aquarium, this can be mimicked by feeding them a spirulina based pellet or flake, and a high quality flake food. One of the best prepared foods for them is Hikari Sinking Wafers. They should also be fed frozen foods as a treat, with their favorites being tubifex or blackworms, bloodworms and daphnia. If you don’t have access to a spirulina based food, they can also be fed vegetables on a regular basis. The most readily accepted vegetables are blanched zucchini medallions, shelled peas and cucumber medallions. It doesn’t take long for a few adult weather loaches to devour a whole zucchini medallion, but you should still remove any uneaten vegetables after 24 hours. This helps to prevent it from rotting and fouling the aquarium water. 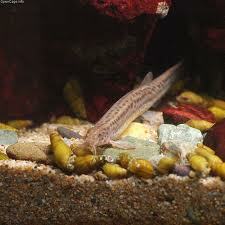 Since weather loaches are cool water fishes, they require a trigger to start the breeding process. This can be accomplished through keeping the weather loaches in a room that has low temperatures in the winter and spring, and changing the amount of light that they receive in the spring. Lighting in their tank should be reduced in the winter, and slowly increased in the spring until they are getting a minimum of 12 hours of light in the aquarium. When breeding is triggered in the weather loach, the male will begin to court the female which can last several hours. He will then wrap himself around the female until the eggs are released, and then fertilize them. The eggs will generally hatch within a few days, and the fry are so small that they will have to fed infusoria or special commercial fry food for up to a week. After this, they can be fed baby brine shrimp and powdered spirulina pellets. I purchased two weather loaches from the pet store today. The employee assured us that they would be fine in 76 degree water that we keep for our gouramies and catfish. Will this cause a problem for the loaches? Further, is covering the top of the tank a necessity? We have a 3/4 hood with a large hob filter. Should we find a way to cover the rest? Aside from shortening their lifespan, the temperature should be fine. They do prefer cool water, but they can also exist in tropical aquariums. As for the aquarium, I would strongly recommend finding some way to cover it. Even using a mesh or something to prevent them from jumping out should be fine. Will these loach’s live in harmony with fancy goldfish? (no other fish). The tank is 5′ long and 18″ wide I think its a 110 gallon tank, will have pool filter sand for substrate probably no heater. I will probably use a Fluval FX 6 with a sump for filtration. Decorations will be round rocks and a big piece of driftwood. In my experience, they are one of, if not the best, tankmates for goldfish. I have a large tank with some fancy goldfish, and close to half a dozen weather loaches living in harmony with each other. Weather loaches actually prefer cooler temperatures like goldfish, and tend to live longer when kept out of tropical tanks. It was the size of my index finger when I got it 8 about 9 inches when I got rid of it. Was such a cool fish, hated to get rid of it. My tank is 65 gallons. Since your tank is bigger maybe this won’t happen. Just keep watch as a loach gets big. Wow, that sounds horrible. I’ve never heard of dojo loaches doing that before, but it’s good to know they’re capable of that. I brought 2 gold fish at the same time as my loach and it killed both gold fish within a week all fish were the same length so I would suggest getting bigger gold fish not that I have put any more with him since. That’s strange behavior. How did the loach kill them? I bought a weather loach recently and put it with danios and platys. I have some established shrimps in the tank which he just chases away at the moment. Could he become a problem when he gets bigger? It depends on the shrimp. The smaller species may be at risk, but I’ve never heard of them eating the larger species like ghost and amano shrimp. That’s purely anecdotal though, and I don’t have any real research to back this up. That’s unfortunate. Was the crayfish molting? Are you just planning on using natural lighting or just room lighting? As long as they aren’t kept in darkness, they should be alright. How about in outdoor ponds? Will the relatively mild NW Winter be a problem? They are temperate fish, and should survive as long as the water doesn’t completely ice over. But weather loaches are pretty boring in ponds. They hide at the bottom and you’ll rarely see them. I keep mine with larger river stones, to prevent digging, in my cold water subtropical planted aquarium. It’s in a Walstad method tank, so there’s dirt below the stones. Would it be okay with just stones or do they really need to dig? They should be fine with the larger stones, as long as there are no sharp edges on the river rocks. Just make sure to use stones worn smooth and they will do well. They usually do better in groups of at least three, so as long as you keep on top of the aquarium, you should be mostly alright with a 30 gallon tank. It’s right of the edge of being overstocked, so as they grow, you just need to keep an eye on the water quality. Also, as long as the stones don’t have sharp edges, they should be fine. i am looking for big weather loaches for sale, anyone getting rid? Hi Robert, when breeding where will Dojo’s lay their eggs? I have some eggs stuck to the side of my tank and I’m trying to figure out if they’re my Gold Dojo’s or if they’re my dwarf cories lol. Dojo loaches are egg scatterers, so the eggs adhering to the glass would be the cory eggs. Most of the time dojo loaches will scatter them over plants in small bursts. Hopefully they’ll spawn for you soon. Just lost our weather loach today. Was between 12-14 years old. Algenon will be missed😥. I’m sorry to hear that. My wife thinks they look like snakes and is afraid of them, but I think they’re great little fish. It’s tough losing an interactive fish like this, but you did a great job keeping it alive as long as you did. It must have had a good life. Cheers Robert, spent its life in a tank with other g/fish in my wife’s hairdressing salon. Initially clients had that ‘ugh, what’s that?’ response. Over the later years he/she was their favourite, ‘where is he?’ Paid for his keep many times over distracting kids who didn’t want haircuts! I got a calico gold fish and a weather dojo loach. All I had right then was a 5 gallon tank. They are still pretty small and both healthy but I looked up what sizes they both need and I wanted to know if i could just stay with one weather dojo and go up to a 20gallon and be okay.? I”VE Been reading the different posts about the dojo loaches&I was wondering because I have a 29 so roughly 30 gallon Aquarium with hilstream habitat theme setup;the question is I have started keeping khuli loaches wich I have currently black&banded…I’ve heard that the dojo is the largest khuli species getting up to 16″ I think that’s to big also do they get along with the other species? Dojo loaches really won’t be that happy in a hillstream habitat. They prefer slow moving or still water, and while they may get along (though dojo loaches may eat much smaller loaches), they really shouldn’t be kept together. I have a loach, not sure which species, that is around 7.5 inches in a 29 gallon tank. And boy is it unusual. Loaches are bottom feeders, but mine feeds a lot on the surface, and continually jumps out of the water. Also their very hardy, mine is now perfectly healthy after pulling through a case of ick that had it trying to breath air and spiraling in circles. Loaches are an amazing fish and it definitely sounds like you have an unusual (and tough) one. And it definitely sounds like you’re doing something right. Hi, I have a water loach and I’m wondering whether I could house it with a Axolotl ? Generally speaking, fish and axolotls don’t mix very well. The fish will either nibble on the axolotls gills or the axolotls will eat the fish. However, you might find some success with weather loaches since likely wouldn’t nibble on the gills and they grow large enough to avoid being eaten. But you would need a mature weather loach – probably at least six inches long – if you have any chance of success. Still, it could be risky and if you see any aggression issues, you will need a back up of where you rehome the fish.